Glass floor tiles and flooring are relatively new concepts in both interior and exterior flooring and can be incorporated into commercial and private properties. There are a range of styles available from opaque glass which can be backlit to clear glass designed to be looked through. Glass floor tiles are normally constructed from laminated glass as safety is of primary importance. The glass with be thick and very heavy which will require a specialist support system. Before installation takes place calculations will have to be made regarding type of use the floor will be put to. British Standards exist for this type of flooring ranging from domestic to industrial buildings. Many shopping centres and office complexes are making use of this new technology where the use of glass floors can have give a stunning effect. There is also an environmental advantage to buildings using glass panelling and floors as natural daylight will flow from room to room therefore reducing the amount of electric light required, this in turn will mean cheaper bills for companies occupying such buildings. Nightclubs and discos are now opting for glass floor tiles, however they normally use opaque glass often backlit using long life LED lights which can be linked to a sound system resulting in a pulsating image changing in time to the music. Alternatively individual glass panels can be installed with different coloured bulbs which can again be linked to the music allowing changing images to be created. Throughout the world tower buildings have been built offering a mixture of office and living accommodation, incorporating a tourist attraction on higher levels. Some of these buildings have glass floor tiles to enable the tourist to stand on it and look down the full height of the building. Quite a scary prospect. One tower building, opened in 2006 in Melbourne, Australia is the Eureka Tower. This tower has gone one step further and has a feature, called 'The Edge' this is a glass cube that you can stand in. Once the doors are closed the whole room glides outside the building, at this point the windows are opaque. Once the cube reaches out over the edge of the building the special coating on the windows clears and the passengers can see clearly out all sides. They can also look down and see the ground some 300 metres below them as the floor is also made entirely of glass. Not an experience for the faint hearted. 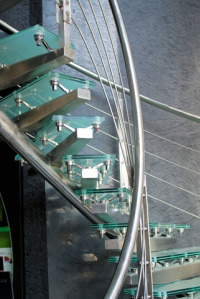 Glass stair treads are now being fitted into some ultra modern homes. These glass panels are very thick to enable them to bear weight. They can be fitted into metal framework or can be cantilevered into the wall to give the impression of a floating staircase. The panels can be specially treated to leave them with an anti slip finish.